There’s decorating, and then there’s organizing. From the Instagram-sensation home experts (with a serious fan club that includes Reese Witherspoon, Gwyneth Paltrow, and Mindy Kaling), here is an accessible, room-by-room guide to establishing new order in your home. Believe this: every single space in your house has the potential to function efficiently and look great. The mishmash of summer and winter clothes in the closet? Yep. Even the dreaded junk drawer? Consider it done. And the best news: it’s not hard to do–in fact, it’s a lot of fun. From the home organizers who made their orderly eye candy the method that everyone swears by comes Joanna and Clea’s signature approach to decluttering. The Home Edit walks you through paring down your belongings in every room, arranging them in a stunning and easy-to-find way (hello, labels! ), and maintaining the system so you don’t need another do-over in six months. When you’re done, you’ll not only know exactly where to find things, but you’ll also love the way it looks. 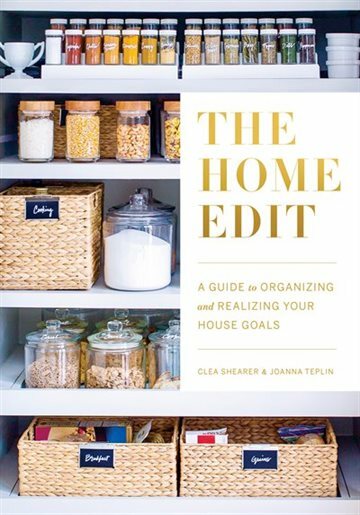 A masterclass and look book in one, The Home Edit is filled with bright photographs and detailed tips, from placing plastic dishware in a drawer where little hands can reach to categorizing pantry items by color (there’s nothing like a little ROYGBIV to soothe the soul). Above all, it’s like having your best friends at your side to help you turn the chaos into calm.